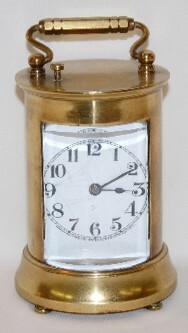 Waterbury "Wayfarer" Oval Carriage Clock marked porcelain dial; 1 beveled glass panel; winding holes are on the back of the case; bell strike on the bottom. (Dial fractured.) Not tested. 3 3/4"